Your private keys are created when you first open your Exodus wallet. You can think of them as a password to a digital bank account. You have a private key for each of your assets (Bitcoin, Litecoin, Ethereum, etc) and it is actually your private keys that mathematically generate your public addresses, so they are connected in pairs. You will have as many private keys as you have addresses. A private key is essentially proof that you own a public address. Without the private key, you cannot prove that the funds in the public address are yours. Private keys are different from your public receiving address. You can give your public address to anyone that asks for it, but you must always keep your private keys a secret. Exodus makes it easy so that 90% of the time you never have to worry about your private keys. They are hidden inside Exodus and can only be viewed using our developer menu - this way, you're the only one that has access to your private keys. Never give your private keys to anyone no matter how "safe" they say it is (not even to us). There are many scams out there that will ask you for your private key. If you'd like to learn more ways of protecting yourself from scams, and for other safety tips, read How do I keep my money safe?. 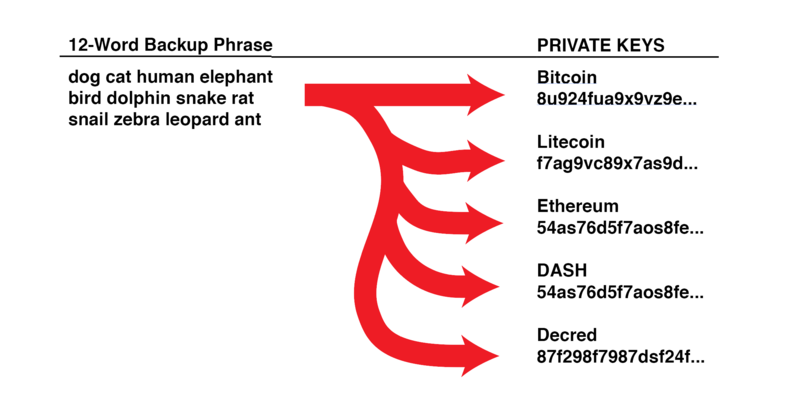 Private keys are also different from your 12-word seed phrase. While each private key is attached to a specific asset, the 12-word phrase is used to generate all of your private keys for all of your assets in Exodus - think of it as your Master Private Key. This is why it's important to always keep your 12-word seed phrase safe and not to share it with anyone, not even support staff at Exodus. If a person half-way around the world gains access to either your 12-word seed phrase or any of your private keys, they'll be able to steal your assets without having to input your Exodus password. If you'd like to learn how to view your private keys, please reference this page: How can I view my private keys?